Accutech Auto Care // Quality Service and Repair at a Price that's Fair! Our shop is a full service repair center that can provide just about every service and repair need, from smog checks and oil changes to engine replacements and complex electrical diagnostics. We do it all and we do it well. 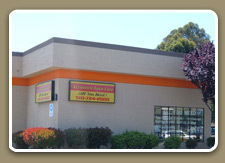 Our staff is friendly and courteous ASE Certified and Master Technicians. We service most makes and models and most vehicle types including passenger cars, light and medium duty trucks, SUVs, mini vans, RVs and Hybrids. © 2012 Accutech Auto Care / All Rights Reserved.